Official Trailer For CLOSE CALLS Is Within! 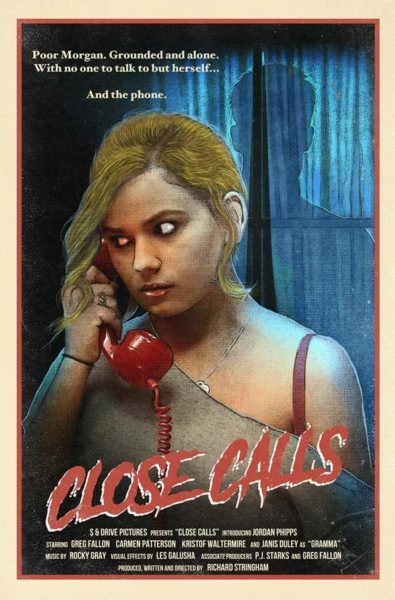 Terror Films has now acquired the rights to writer/director Richard Stringham's CLOSE CALLS. Making the rounds at the film festivals, the film has earned a reputation for itself, winning several awards. We have the official trailer for you to enjoy. It can be found below. CLOSE CALLS stars Jordan Phipps, Kristof Waltermire, Greg Fallon and Janis Duley. "The film centers around Morgan MacKenzie – a troubled teen with a checkered past, who finds herself grounded by her father. Bored and left alone to deal with her ailing and crazy grandmother, Morgan soon becomes the target of a psycho caller. As the night gets weirder, paranoia begins to set in and Morgan is forced to face some of her worst fears and inner demons as she starts to believe that everyone she knows is either plotting against her or trying to kill her." CLOSE CALLS is now available across multiple digital platforms.